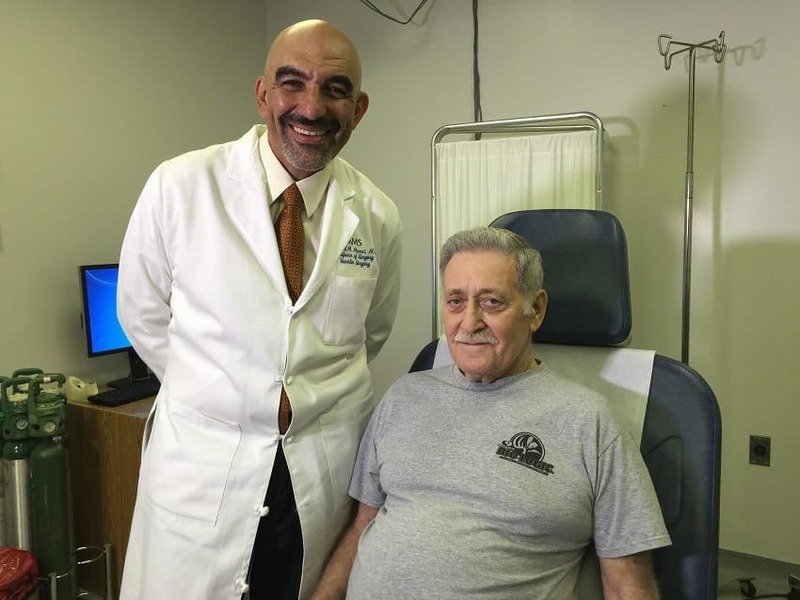 Mohammed Moursi, M.D., performed the first z-fen graft procedure at UAMS on Glenn Harvey, of Star City. The z-fen graft is minimally invasive compared to standard grafts, meaning shorter hospital stays and quicker recoveries. May. 9, 2016 | May 9, 2016 | Glenn Harvey didn’t know he had an aortic aneurysm. Thanks to a new procedure, performed for the first time at UAMS in March, he still can’t feel a thing. Mohammed Moursi, M.D., chief of vascular surgery and program director of the vascular surgery residency program at UAMS, performed the procedure on Harvey using the Zenith Fenestrated AAA Endovascular graft, or z-fen, to treat an abdominal aortic aneurysm. The aorta is the main blood vessel that supplies blood to the abdomen, pelvis and legs. An abdominal aortic aneurysm occurs when an area of the aorta becomes very large or balloons out. The larger the aneurysm, the more likely it is to break open or tear, which can be life-threatening. Until recently, vascular surgeons could only repair the aneurysm through an open surgery for those with more complicated cases, like Harvey. Now, they can use the z-fen graft, which only requires a small incision in the groin. That means shorter hospital stays and quicker recoveries. A standard endovascular stent graft resembles a Chinese finger trap, with zigzagging wires wrapped around a fabric tube about the size of a pencil. Surgeons carefully construct and expand the graft inside the aorta using balloons and the self-expanding nature of the stent material. The minimally invasive surgery can prevent certain patients from having kidney failure. What makes the z-fen unique is that it has fenestrations, or holes, to allow blood flow to the renal arteries. Each graft is specially made, said Moursi. “We measure exactly where the kidney arteries are and fit it to the patient’s exact anatomy,” he said. Harvey, of Star City, is the first recipient of a z-fen graft at UAMS. He’s survived two aortic aneurysms – the first in 2007. Just two weeks removed from surgery, Harvey is already walking around comfortably and has no pain. Accompanied by his daughter, Brandi Rhoden and granddaughter Calli, both of White Hall, Harvey speaks slowly and deliberately. Abdominal aortic aneurysms are the 13th leading cause of death in the United States. Often, patients have no idea they have an aneurysm until it’s discovered – or bursts. Harvey’s first aneurysm required the open surgery option, which made recovery difficult. A series of CT scans in the ensuing years discovered the second aneurysm. That’s when Harvey was referred to UAMS, and Moursi. He credits Moursi and UAMS with saving his life.